All events at the Glendale Public Library are public, and participants may be photographed by the media and or City staff for future print and/or online publication. It is 1939. Nazi Germany. Liesel is a foster girl living outside of Munich, who scratches out a meager existence for herself by stealing when she encounters something she can’t resist – books. The Our Parents Made Us Do This Book Club will discuss The Book Thief By Markus Zusak. According to his publisher, Australian author Markus Zusak grew up hearing stories about Nazi Germany, about the bombing of Munich and about Jews being marched through his mother’s small, German town. He always knew it was a story he wanted to tell. By the age of 30, Zusak had already asserted himself as one of today’s most innovative and poetic novelists. With the publication of The Book Thief, he was dubbed a ‘literary phenomenon’ by Australian and U.S. critics. 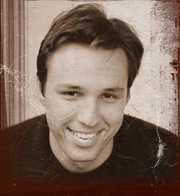 Markus Zusak is currently considered a "single author." If one or more works are by a distinct, homonymous authors, go ahead and split the author. Markus Zusak is composed of 14 names. You can examine and separate out names.